A deadly explosion at a steel plant reveals a workplace safety system where inspections are rushed and penalties are weak or nonexistent. Update, 6/7/12: Two weeks after this story ran, the Occupational Safety and Health Administration announced that it has pared its inspection goal for the year. The revision was made primarily because the agency has been conducting “more complex, time consuming” inspections this year, an agency spokesman wrote in an email. Early on the morning of September 3, 2009, Nicholas Adrian Revetta left the Pittsburgh, Pennsylvania, suburb of Pleasant Hills and drove 15 minutes to a job at US Steel’s Clairton Plant, a soot-blackened industrial complex on the Monongahela River. He never returned home. Revetta was working as a laborer for a US Steel contractor that had employed his father, at the same plant that employed his brother. Shortly before 11:30 a.m., gas leaking from a line in the plant’s Chemicals and Energy Division found an ignition source and exploded, propelling him backward into a steel column and inflicting a fatal blow to his head. Thirty-two years old, he left behind a wife and two young children. Nick Revetta’s death did not make national headlines. No hearings were held into the accident that killed him. No one was fired or sent to jail. Under the Occupational Safety and Health Act of 1970, American workers are entitled to “safe and healthful” conditions. Revetta’s death and the events that followed lay bare the law’s limitations, showing how safety can yield to speed, how fatal accidents can have few consequences for employers, and how federal investigations can be cut short by what some call a de facto quota system. In the Revetta case, the Department of Labor’s Occupational Safety and Health Administration (OSHA) failed to issue even a minor citation to US Steel, the world’s 12th-largest steelmaker and an economic leviathan in western Pennsylvania. The company paid no fine, although current and former workers say that its contractors— including Revetta’s employer—faced intense pressure to finish their work. David Michaels, assistant secretary of labor for occupational safety and health, would not talk about the Revetta case; nor would Robert Szymanski, the head of OSHA’s Pittsburgh Area Office. Edward Selker, the now-retired OSHA deputy regional administrator who urged inspector Laughlin to go hit golf balls, did not return calls to his home. A US Steel spokeswoman declined to comment. In a court filing, the company has denied any negligence in the case. More than 4,500 American workers are killed on the job annually. There were 4,690 workplace deaths in 2010, a 3 percent increase from 2009. (A decade earlier, the annual toll exceeded 6,000. The soft economy, the Bureau of Labor Statistics notes, has led to fewer workers and less work in high-risk industries such as construction.) The US workplace fatality rate remains roughly six times that of the United Kingdom, which has stricter safety rules. It would take the perpetually short-staffed OSHA more than 130 years to inspect every workplace in the United States. Managers and their underlings must strike a balance between meeting “performance goals” set in Washington and conducting comprehensive inspections when deaths occur. A target of 42,250 inspections nationwide was established for fiscal year 2012, up 5.6 percent from the previous year’s goal. The number of federal inspectors, meanwhile, has stayed mostly flat; there were 1,118 in February 2012. It would take the perpetually short-staffed OSHA more than 130 years to inspect every workplace in the United States. In August 2011, with the federal fiscal year nearing a close, an unidentified safety supervisor in the OSHA regional office covering Pennsylvania, Delaware, Maryland, Virginia, West Virginia, and Washington, DC, urged inspectors to step up their pace and not get bogged down in the minutiae of complex cases, including those involving deaths and serious injuries. “As per our calculations this morning, we need an average of 14 inspections opened per week,” wrote the supervisor, whose name was removed from an email obtained by the Center for Public Integrity. The supervisor went on: “Essentially, do what you gotta do to stay gainfully employed. It’s great to be caught up, but we only have a short window to open enough inspections to make all of our goals. I suppose you could say, ‘it’s not my problem’ but I can’t guarantee there wouldn’t be a ton of heat coming down from the RO [regional office] on any office that falls short. We are going to be getting a new RA [regional administrator] soon and being perceived as ‘slackers’ is not a good first impression. I know how difficult all of the accidents/fatalities/sig [significant] cases have been on everyone but unfortunately that won’t likely be taken into consideration when the clock strikes October”—the beginning of the new fiscal year. Nick Revetta’s older brother, Patrick, is tall and solidly built, with grey stubble. Forty years old, he lives 11 miles from Clairton but has tried to avoid the place since the accident. He made an exception one bitterly cold day in January 2011. 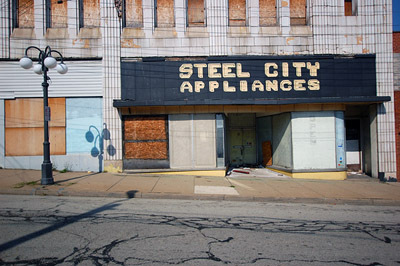 After pointing out the stadium where he played quarterback for the Clairton High School Bears, he drove past a string of deserted businesses on his way to US Steel’s hulking Clairton Plant. Clairton, a city of 6,800 about 15 miles south of Pittsburgh, has seen better days. In 1980, US Steel employed nearly 5,000 at its complex, where coal is superheated in ovens and turned into coke, a key ingredient in steel. Though the plant remains a major employer, its staffing has dropped by three-quarters, not counting contract workers. Almost one-quarter of the city’s residents and nearly half of its children live in poverty. The Revetta brothers and their sister, Kathy, grew up in Clairton the 1970s and ’80s. “This place was booming,” Patrick recalls. Stocky and stoic, Nick was the “spitting image” of his father Adrian, who worked for Power Piping Co., a construction and fabrication contractor. “They walked alike. They were built the same way—like bulls, basically,” Patrick says. Adrian got Nick a job at Power Piping; Nick would work there for 11 years. 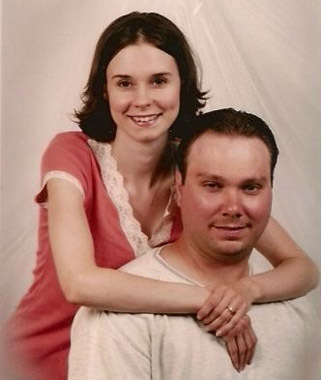 Nick met Maureen Mulligan in 1994, when they were 17, and they married nine years later. Their son Nick was born in 2005, their daughter Gianna in 2008. The children’s names were tattooed on their father’s right arm, along with the word Italia, a nod to his heritage. 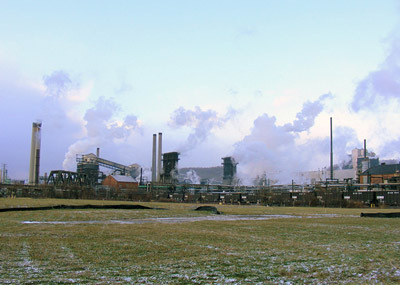 The Clairton Plant is the largest operation of its kind in the country, with 12 clusters of coke ovens, known as batteries, which produce 4.7 million tons of the carbon-rich fuel annually. At the depth of the recession, in early 2009, coke prices were depressed and activity in Clairton was sluggish. As prices began to rebound that year, “there was a mad rush to get everything up and running again,” Patrick says. OSHA inspector Laughlin’s voluminous notes reflect the frenetic work environment for US Steel contractors such as Power Piping. “They were pushing the manpower…US Steel pushing…pushing people,” Laughlin wrote while transcribing one worker interview. Four days before Labor Day 2009, Nick and a coworker were given a routine assignment. They were to repair concrete pillars supporting the dormant B Cold Box, a pipe-filled structure the size of a storage pod in the No. 2 control room. The box is part of a cryogenic process used to separate “light oil” containing benzene, xylene, and toluene from coke-oven gas. Nick was standing near the box, getting ready to mix grout, when, at 11:26 a.m., an explosion sent him hurtling backward into a column. He appears to have died instantly. A foreman at the plant later told OSHA inspector Laughlin that it looked like Nick had been buried in a snow drift, the “snow” being piles of white, fluffy insulation blown from the B Cold Box. At the moment of the blast, Patrick was coming off his shift at the plant’s B Battery, maybe 100 yards away. “I heard a loud arcing noise,” he recalls. “I turned in that direction and saw the flash and heard the explosion.” He called Nick three times on his cellphone but got no answer. Patrick ran to the lunch trailer and encountered Nick’s boss, who said Nick was unaccounted for. Then he saw his brother being carried out on a stretcher. Patrick’s chest grew tight, his breathing labored. He thought he was having a heart attack and was taken by ambulance to the plant clinic. US Steel officials followed Laughlin as he worked. “Whenever he would take a picture,” Bezy says, “there would be a US Steel guy with a camera, taking the same picture.” Three well-dressed corporate security officials from Pittsburgh appeared at the plant several hours after the accident, Bezy says, and forbade Clairton managers from sitting in on interviews with lower-level employees, as would customarily occur. “It looked to me like US Steel’s own managers were intimidated,” she says. Early in his investigation, Laughlin realized that he needed help navigating the complex federal rules detailing the steps companies must take to prevent catastrophic fires, explosions, and chemical releases. He kept pressing Pittsburgh area director Szymanski to pair him with someone who had expertise in this “process safety management” protocol. OSHA has several hundred inspectors nationwide with such specialized training, including two in Pittsburgh. These specialists can draw conclusions from mangled pipes and burned-out vessels—clues likely to be missed by generalists like Laughlin. 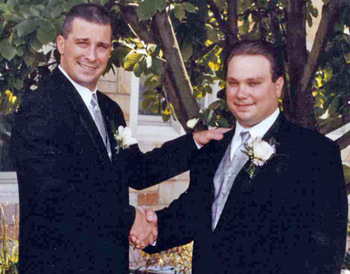 The precise cause of the explosion that killed Nick Revetta remains a mystery. Workers had been grinding and welding on the B Cold Box just prior to the blast, but none of the witnesses interviewed by Laughlin reported smelling gas. “No evacuation alarm ever went off,” a foreman told Laughlin, according to the inspector’s notes. Another witness said he’d heard “a large gas escaping sound—definitely a pipe hissing—and [seen] a big ball of fire” near Quad 3, a trailer-sized structure, containing four cryogenic vessels, located close to the disabled B Cold Box. There had been an explosion in Quad 3 in 2005. No one was hurt, and US Steel blamed the event on lightning. Gismondi, Maureen Revetta’s lawyer, says US Steel’s own investigation, which has not been made public, concluded that “there was a gas leak inside [Quad 3] and oxygen got in.” This suggests that two of the three ingredients required for an explosion—flammable gas and oxygen—were present. All that was needed was an ignition source—something as simple as static electricity. US Steel declined to comment. Ten months after Nick Revetta’s death, another explosion rocked the Clairton Plant, injuring 17 workers. OSHA blamed the accident on a contractor shortcut that had been approved by US Steel, an allegation the company is contesting. John Straub, a senior operating technician with US Steel, was at home the morning Nick Revetta died. He learned about the explosion from his wife, who’d seen a bulletin on TV. “I said, ‘I know exactly where it was. '” A casual acquaintance of the Revetta brothers, Straub had worked in the area of the blast and had been troubled by what he described as sloppy “hot work” procedures designed to contain sparks from welding and burning. Straub filed a 10-page, handwritten complaint with OSHA’s Pittsburgh office in January 2010, alleging that US Steel had violated the process safety management standard. Straub claimed that several “near-misses” in the No. 2 control room before Revetta’s death hadn’t been investigated. Six months later, OSHA cited US Steel for five “serious” violations related to Straub’s complaint and proposed a $32,400 fine. The company settled and paid $19,800. Not long after Straub filed his complaint, Maureen Revetta learned that OSHA’s investigation into her husband’s death had been closed, with no citations issued to US Steel. She and Gismondi had two unsatisfying meetings with OSHA officials in the summer of 2010. In the first, “One guy said, ‘We don’t have enough resources,'” Maureen recalls. “I wouldn’t tell parents that I don’t have enough resources to teach their kids. I have to figure it out. That’s no excuse.” In the second meeting, which included then-deputy regional administrator Selker, Gismondi produced inspector Laughlin’s written request for help and asked why it hadn’t been honored. “They were flustered,” the lawyer says. Indeed, one week before Oleszewski cited US Steel for violations stemming from the Straub complaint, the Clairton Plant blew up again. 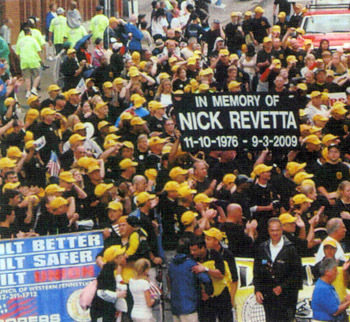 It was not even a year after Nick Revetta was killed. Lentz says that a gas alarm went off several times, but a US Steel supervisor silenced it each time. “I was thinking, ‘I gotta hurry,'” Lentz says. He was rushing to tighten the bolts on the flanges when a wall of flame “came right at me and blew me over.” He remembers picking himself up off the ground and hearing screams: “You thought someone was dying.” The fire peeled the skin off his hands; his ears and the back of his head were burned as well. Others, including the US Steel supervisor, were burned more severely. OSHA said the procedure approved by US Steel—allowing coke oven gas to keep flowing through the line rather than shutting it off and purging it with nitrogen—invited disaster. The agency cited the company for 12 alleged violations and proposed a $143,500 fine. One violation was classified as “willful,” suggesting OSHA believes the steelmaker either disregarded or was “plainly indifferent” to safety rules. US Steel is appealing. Lentz and other workers hurt in the accident are suing the company. Patrick Revetta has lost 30 pounds since Nick was killed. “He’s not the same person I’ve known for 10 years,” says his wife, Kathy. “He holds everything in. He sits there in a daze.” Still a US Steel employee, Patrick is out on medical leave for post-traumatic stress disorder. On a Saturday in January last year, he drove to the snow-covered Finleyville Cemetery, where his brother, parents, and grandfather are buried, and parked his truck next to the family plots. A small Pittsburgh Penguins flag fluttered next to Nick’s headstone; following the hockey team had been one of his passions. On his way down the hill a few minutes later, Patrick gave his horn two taps. Goodbye, little brother.